• Place the tea bags in a large heatproof glass pitcher. • Use a vegetable peeler to strip the peel from the lemon or orange, avoiding as much of the white pith as possible. • Add the peel to the pitcher. • Pour the simmering water into the pitcher and let it steep for at least 5 minutes. • Remove the tea bags and discard. • Refrigerate the tea until cool. 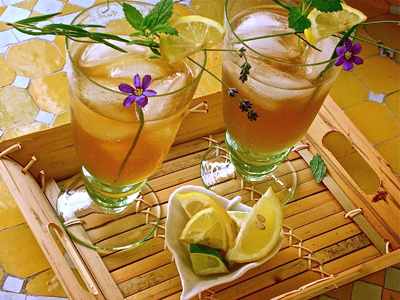 • To serve, fill iced tea glasses with ice and pour the tea over the ice. • Sweeten with simple syrup, if desired. • Place sugar and water in a small saucepan and stir to combine. • Bring to a gentle boil over medium-high heat. • Reduce heat and simmer until sugar is completely dissolved and syrup is slightly thickened, about 3 minutes. • Remove from heat and let cool. • Transfer syrup to a container with a tight fitting lid, cover, and refrigerate until ready to use.